Hello friends! Welcome back for another episode from my monthly video tutorial for Papertrey Ink from the “In The Studio with Yana” video series. I am sharing video tutorials for Papertrey Ink on the 24th of each month on their blog and later repost them here, on my blog; you can catch previous episodes here. 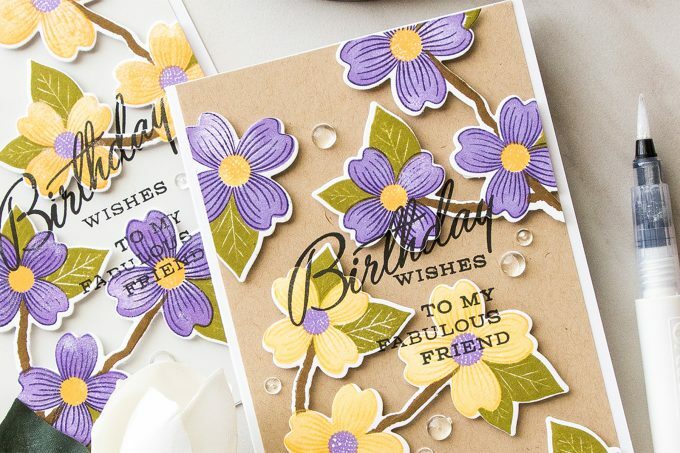 I seem to be lacking Birthday cards in my handmade card stash so I thought it would be a good idea to create several cards to have on hand for the upcoming Spring Birthdays. 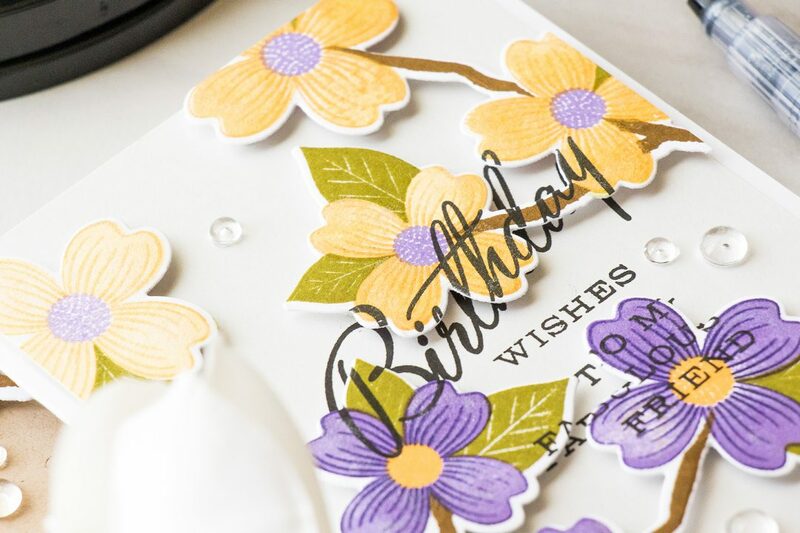 I liked new Warm Regards stamp set from Papertrey Ink a lot – I especially loved that the flowers come on a branch and I always associate flowers on a branch with Spring flowers and blooming trees so I was excited to use this set for my Spring Birthday cards. 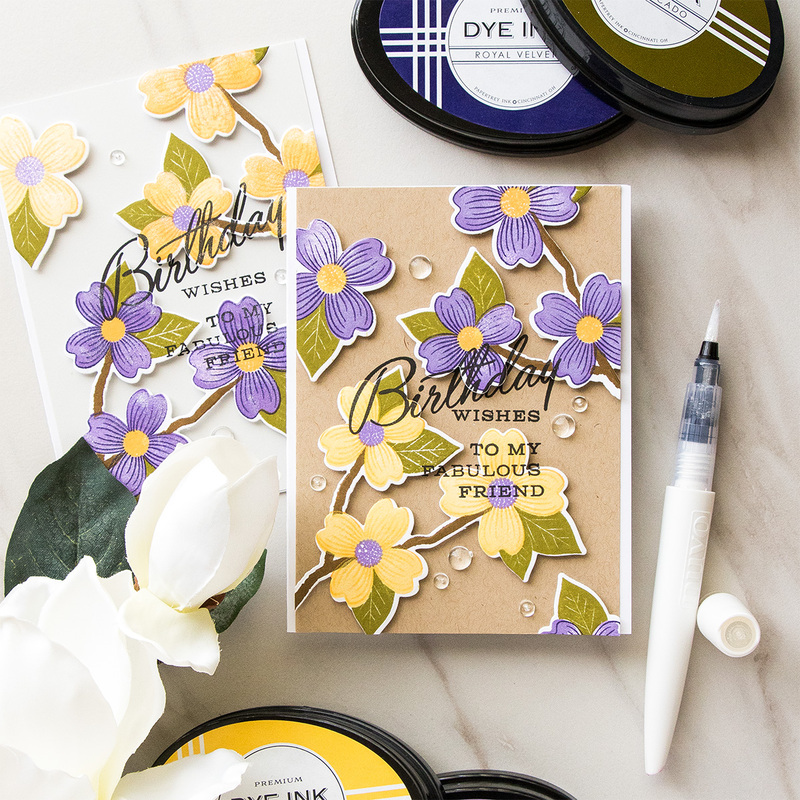 I stamped several blooming branches onto Stamper’s Select White cardstock using Cocoa Bean ink for the branch, Ripe Avocado ink for the leaves as well as Summer Sunrise and Harvest Gold for some of my flowers along with Royal Velvet and Amethyst Allure for the rest of the flowers. The Warm Regards stamp set is a layering set and it’s a very well designed set, too. You have a branch and 3 flowers blooming on a branch. 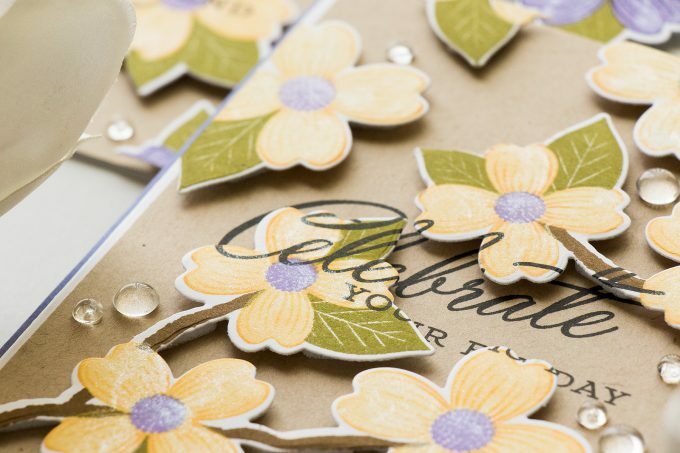 To make it easier for us stampers to align everything, the flowers and also the leaves and flower centers are grouped together, so even though there are 3 flowers that you need to stamp on the branch these aren’t 3 separate flowers, but rather one stamp that includes all 3 flowers right away so that makes it significantly easier to align everything and have great results quickly. 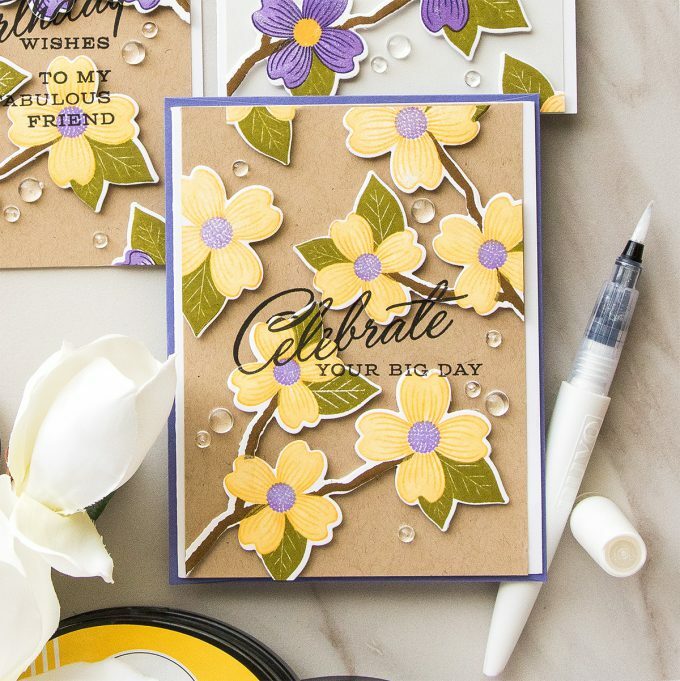 The flowers themselves have 3 steps to them – there’s an outline image and this one also adds beautiful detail to the petals, there’s also a solid layer that adds color to the petals and then there’s the flower center image. The leaves are also grouped together so you are not fussing around with each individual leaf trying to figure out where it goes. The leaves are coming from behind the flowers and when stamped look as if the flowers were masked. I really like that – I’m not a fan of masking, so having an image where the masking has been done for me is always fantastic. 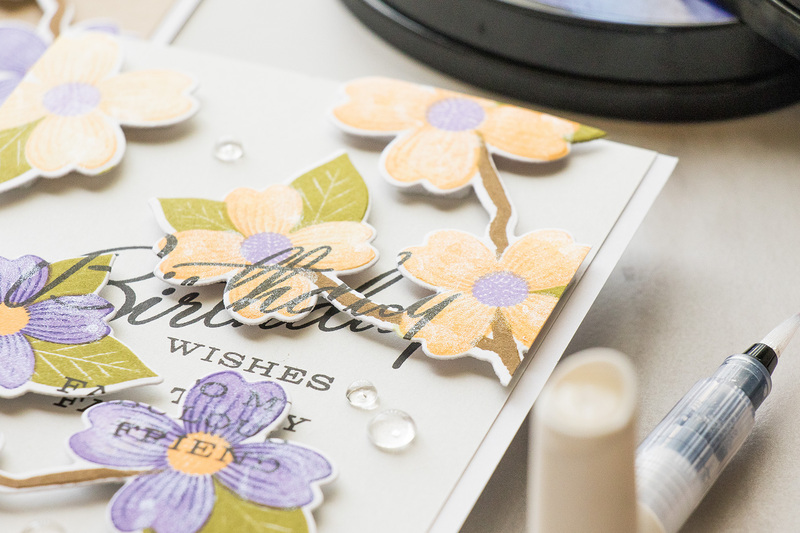 Once my stamping was done I cut branches out using a coordinating die. Next, I positioned my branches onto a Kraft cardstock panel (also used Soft Stone for another card) and with the help of a stamp platform tool I stamped my sentiments onto both the die cut branches and background panels. I foam mounted the branches being careful to align the text and made sure it was easy to read. I also embellished my cards using an Aqua Shimmer pen from Tonic Studios and clear droplets to mimic morning dew. Hi Yana, wow, how beautiful, those flowers are so pretty and I love the color combo. Thanks for sharing. Beautiful flowers! I love watching you color and your beautiful creations! 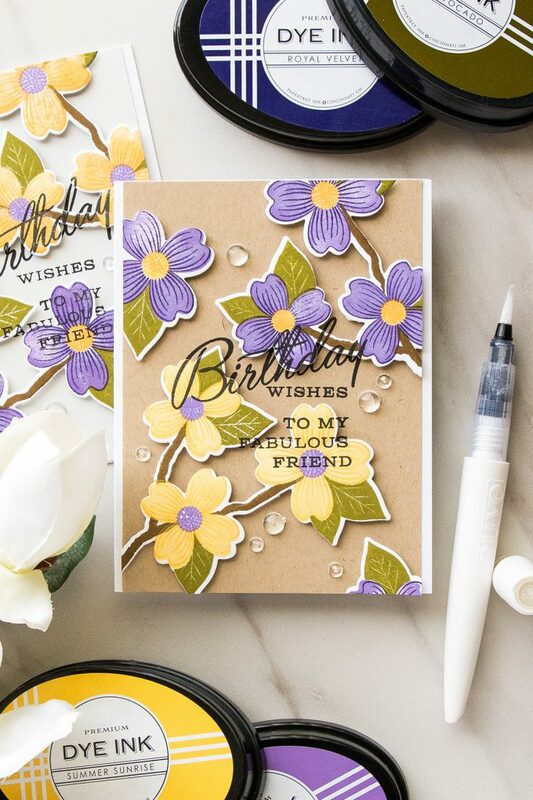 Beautiful stamp set and card. I love the way you did the sentiment. Love this set, very pretty. I like how you incorporated the layered look stamping words behind and raised. Such a cute idea.